Margot is Rector of Wychert Vale Benefice (From Feb. 9th 2009), having previously been Chaplain of Jesus College, Oxford. She is also on the management boards of the John Ray Initiative, an educational charity seeking to link faith and environment, and A Rocha UK. 2) Visiting Researcher in Environmental Biology at Oxford Brookes University. He does some teaching and quite a bit of research there. 3) Martin is Operations Manager for the John Ray Initiative. He manages a small staff team based in Gloucester. 4) Martin is Principal Tutor of a distance leaning course leading to a Certificate in Christian Rural and Environmental Studies (CRES). This is co-sponsored by the John Ray Initiative and A Rocha UK. It is based at Ripon College, Cuddesdon, nr. Oxford. Martin's website has information about his research and teaching. A Christian Guide to Environmental Issues is our 2015 book for the Bible Reading Fellowship. The Ethics of Climatic Scepticism is our 2015 Grove Booklet. Functional Biology of Plants is the major plant science text book that Martin co-wrote with John Bryant (2012). Uncovering Isaiah's Environmental Ethics is Margot's 2011 Grove Booklet. Climate Change, Faith and Rural Communities is our 2011 booklet for the Agriculture and Theology Project. Cherishing the Earth has lots of information about our 2008 book. A Feast of Seasons is a site giving information about Margot's 2000 book. Olive Roots is a small site providing the teaching materials from study days that Margot has led. 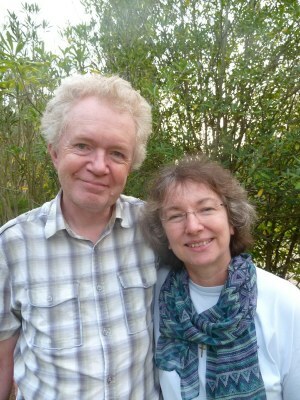 In 2013 we also started Martin and Margot Hodson's Blog to help publicise our writing and speaking.